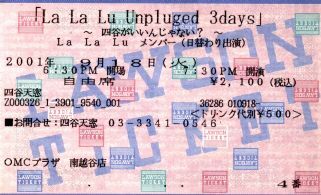 The second day of the LaLaLu Unplugged 3 Days event took place on September 18, 2001. The LaLaLu girls who appeared were Hinano Mayo, Itou Asuka, Aina, Shintani Sayaka, and Minano Fuuko. But Ohtsuka Mae came as a surprise guest. Fuuko played music from Dragon Quest and Final Fantasy on the piano.